UK ministers have been urged to halt airport expansion until the true costs and benefits of the proposed increase in flying are properly understood. The Sustainable Development Commission (SDC) and the Institute for Public Policy Research (IPPR) have been examining aviation policy for a year. They conclude that so much fundamental data is disputed that an independent inquiry is needed to sort it out. The government said it had serious objections to the report's findings. A statement from the Department for Transport (DfT) rejected the notion that a further three-year debate, as requested by the SDC and IPPR, would serve any useful purpose. The economic benefit of aviation: Treasury analysis based on aviation industry research estimates future increases in economic activity through expanded aviation - but excludes any calculation of losses to the UK tourist industry through cheap flights abroad. The impact of aviation's greenhouse gas emissions: This is a particularly difficult area as scientists are still trying to work out exactly how much the heating effect of aircraft emissions is magnified, as the gases are released at altitude. 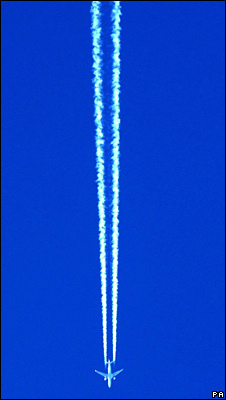 There is also uncertainty over how to express the significance of the heating effect of contrails. The role of technology: The aviation industry believes that many problems can be solved by improved technology. But many experts warn that improvements in technology cannot keep up with the increase in demand for flying. The SDC/IPPR report said all the uncertainty had eroded people's confidence in government policy. They want to see a full investigation - and airport expansion frozen until it is completed. Despite its uncertainties the report does feel free to make one solid observation. It says: "Clashing government priorities across different departments and agencies - including promoting economic growth, meeting future travel needs, protecting the environment, addressing climate change, and ensuring the health and well-being of communities - are contributing to a lack of coherence across government." Hugh Raven, SDC commissioner, said: "The SDC and IPPR held meetings with the government, the aviation industry, academics, NGOs and citizens' groups over a period of a year. "While we expected to find areas of conflict, we were unprepared for the level of fundamental disagreement over the data underpinning the government's whole aviation strategy. "Until some basic questions are answered, the UK cannot be in a position to make major decisions about the future of air travel. "The government must live up to its commitment to listening to voters' concerns, and ensure we make the best possible decisions for everyone involved." Simon Retallack, associate director of the IPPR, added: "It is vital that the evidence is looked at again through an independent and widely supported process. Establishing a special commission to do that provides the government with the best way forward." But a DfT spokesperson said it was "simply wrong to claim that there is a consensus that the evidence base is flawed". "We strongly believe the aviation industry must play its part in meeting its environmental costs which is why the government championed the inclusion of aviation in the EU Emissions Trading Scheme. But given the government has conducted a widespread debate over the last six years, deferring a decision in favour of a further three-year debate as this report suggests is not a serious option." And Michelle Di Leo, director of the aviation lobby group FlyingMatters, said: "The Air Transport White Paper was based on 13 months of public consultation and 500,000 responses. "To completely review that policy would create uncertainty and planning blight for communities around airports in the UK - that would be bad news for everyone not to mention the taxpayer who would have to foot the bill."